Not the sexiest bit of music software, but does it make up for it in usefulness? It's not the sexiest bit of music software, but when it comes to getting a grip on your samples, nothing beats AudioFinder. Incredibly versatile. Free updates for life. Key and BPM detection. Powerful batch renaming. Useful metadata system. Comprehensive search functions. Doesn't run within your DAW. AudioFinder is an audio file organiser that supports a range of audio formats, including WAV, AIFF, REX, MP3 and FLAC. 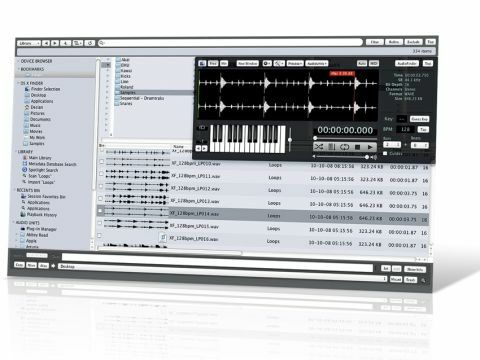 It features a file browser, audio preview (with a virtual keyboard and MIDI control), basic sample editing, batch processing/renaming and much more. Version 5 introduces yet more features, but the most important is undoubtedly the metadata database. Previously, it was possible to organise your sounds into basic 'playlists' for easy access and organisation. Now Iced Audio has added extensive labelling options in the form of metadata. Once you've selected a file, you have access to basic audio editor processes such as gain, normalisation, 'mono-ise', etc. Pitch Analyser is a particularly valuable feature, analysing the file and presenting the results as coloured bars on a frequency scale, with the red bar representing the fundamental frequency. Once you've got your samples tagged up with their fundamental pitch, you can then find a kick to suit the key of your bassline, and so on. AudioFinder also supports AU/VST plug-ins, so you can preview your file through an effect (only one at a time, mind), and commit to your choice by rendering to a new file - it's all very fast and intuitive. A most useful feature of AudioFinder is its Sample Extractor, which is used to extract multiple samples from a single audio file. It splits the files automatically, using a volume threshold to dictate where the files are split and a new sample is created. There are also fade in and out options, and you can set a maximum on the number of samples to create, to give the extractor further guidance. It's especially useful for extracting samples from old-school sample libraries that came on audio CDs, or pulling out the useful parts of field recordings. We also had some success splitting up the hits in drum loops. The Power Rename feature will be of prime interest to those who create their own samples from scratch, and indeed, professional sample library creators. Features include find/replace of filenames (eg, find "bassdrum" and replace it with "Kick_Drum") and the addition of a prefix/postfix, and it can even automatically add the detected pitch and MIDI note number, which is highly useful for making multisampled patches. Add in neat touches like the BPM detector, micro-harmonic sound comparison (to compare frequency distribution of two files), visual waveform preview, drag-and-drop of selected audio sections into your DAW, batch processing and renaming, Mac Finder integration and free updates for life, and it seems crazy not to pick up AudioFinder. AudioFinder really is a boon for anyone who works with samples and a must-have for professional producers. The more you dig into it, the more you appreciate what it can do, and unless you don't actually use samples at all, we can't think of a single reason not to buy it. With AudioFinder's new metadata functionality, each audio file has fields for Creator, BPM, Beats, Time Sig, Key, Library, Genre, Category, Rating, Tags and Notes. All of the fields are then searchable. Tags is very useful as it can hold any words you like: for example, an electro synth stab could be tagged "electro synth bass stab noisy sharp attack". It would then appear in the results when searching for any of those terms in the Tags field. The Notes field is similarly freeform, but more suited to detailed, miscellaneous information. For example, for a kick drum, you could add "that weighty kick I sampled from the B-side of a Deadmau5 track". It's true that similar metadata searching already exists within OS X's Spotlight search feature, and indeed, Spotlight metadata can also be searched within AudioFinder. But with Spotlight, once you find your sample, that's your lot, whereas with AudioFinder, you could be just getting started.